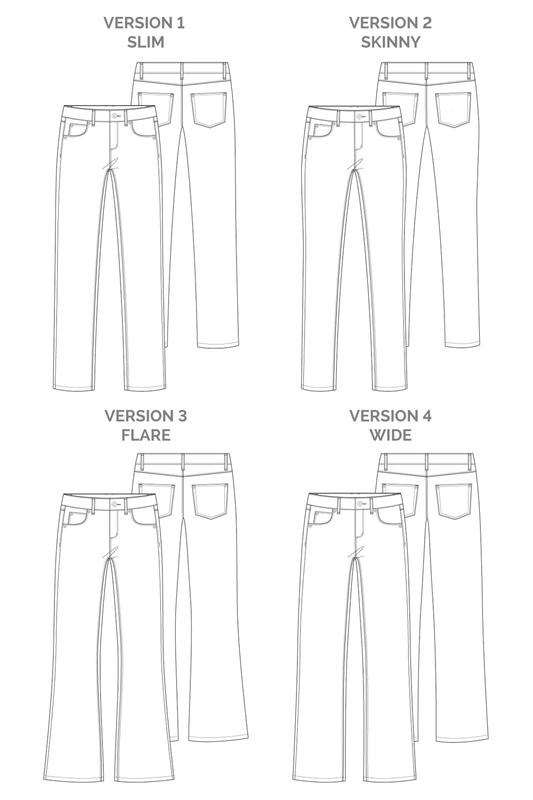 Straight leg, boot cut, cropped, ankle grazers…. the list goes on when it comes to various styles of trousers making it a more popular choice than ever when it comes to being a staple piece in the modern ladies wardrobe. Despite their increasing popularity over the years, trousers weren’t considered ‘acceptable’ women’s attire until the 1970s and even then, in some places it was illegal for women to wear trousers! These days, trousers are worn by women for all occasions without any masculine connotations . One of the woman we can also thank for this is, Coco Chanel - The first woman who dared to wear a pair of pants in her daily life. 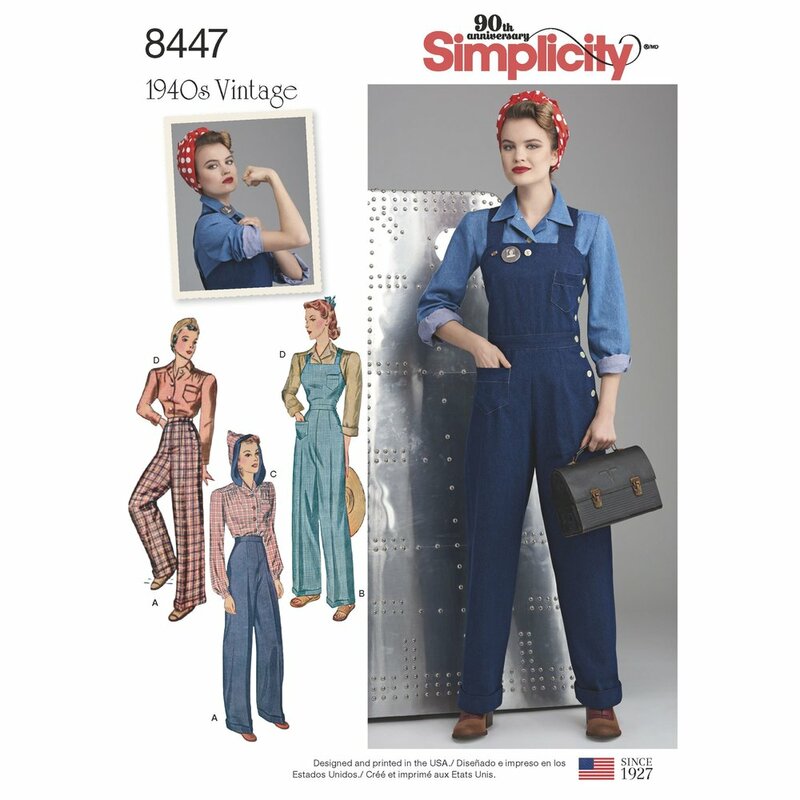 Not only does this 1940s vintage pattern by Simplicity come with the patterns for amazing loose fitting pants & the great overalls…it also comes with a sweet blouse and blouse with hood pattern. I could go on for ages about various trouser patterns I love, I will quickly mention the Tyyni Cigarette trouser pattern by NAMED. I personally think these would be the perfect capsule wardrobe make. These trousers are so flattering that they would look great for both work or day-to-day ! After covering all things coats and jackets in the last capsule wardrobe blog post, it is time to move on to one of the essentials: Tops. Whether its’s shirts, vest tops, blouses, bralets or off the shoulder - you can’t leave the house without one. (Well you could, but it isn’t exactly seen as socially acceptable). In my opinion a top can make or break and outfit…I’d even go as far to say it is the most seen item of clothing you will wear, if you think about it. Sitting at a desk/restaurant or in photos, it is normally the next thing people will notice after your face. That is why when planning your ‘me-made’ capsule wardrobe it is important to not only pick something versatile but something that will also show off your style at a glance. What I love about this pattern (along with the fact is is free), is that by simply changing the fabric you make it in, it almost looks like a totally different design! So don’t be scared to experiment with various weights of jersey or bold/fun prints. You can also mess around with the size/length of this top making it go from off the shoulder crop top to front knot tied cami ! Wanting to try one for yourself but unsure about where to start when it comes to stretch fabrics or the overlocker? Just give us a shout! Sew Confident Founder Jenny modelling some of her lovely hemlock tee makes! Taking part in this months capsule wardrobe theme? Remember to tag us @sewconfident and use the hashtag #SCcapsulewardrobe to win some prizes and be shared on our social media pages and mailing list. Not yet on our mailing list? Sign up here to be the first to hear about all things Sew Confident and receive some mailing list only deals. Do you have what it takes to be the next Sewing Bee Superstar? With the successful come back of the Great British Sewing Bee on BBC 2 and the rise in people trying their hand at sewing, we have a feeling that the competition on next years GBSB is going to be tougher than ever! That is why we are putting together a blog post to help YOU, yes YOU, have a better chance of getting through to being on the show. Like all TV shows they are looking for personality, a good back story. Sadly just being a talented sew-er doesn’t cut it in the days of showbiz and the craving of high show ratings. Therefore you must remember to SELL YOURSELF! Not literally of course, but don’t be shy and overly modest! We are all unique and what you think might be boring or nothing interesting may be just the thing to give your application that extra boost to get through to the next stage. Find yourself stuck and needing a little helping hand from one of our amazing tutors here at Sew Confident? Be sure to check out all GLASGOW classes here and all DUNDEE classes here. The Great British Sewing Bee – Where are they now? Hi everyone, Sew Confident Loyal Amanda here! So, it seems we are all loving the return of the Bee!! Personally I consider myself a bit of a GBSB super fan and I’m not ashamed to say I’m often found re-watching episodes from the last 4 seasons. I have followed a few of the former contestants on Instagram for a while now but with the show back on our screens I wondered how many of the former contestants have been able to give up the day job and make their living from sewing? Although the name Tilly Walnes may not be familiar to you, I’m sure the pattern company Tilly and the Buttons is! Series one contestant Tilly had only been sewing for two years when she featured on the first ever series of Sewing Bee. Since leaving the sewing room she has set up one of the best loved independent pattern companies. She has published numerous well know patterns and two best selling books. Her aim is to “demystify sewing” with her clear, jargon free instructions. Tilly has also won Favourite Sewing Personality at the British Sewing Awards 3 years in a row. Series 1 contestant Stuart has kept very busy since the GBSB. Now a regular of the Sewing Quarter Stuart has also written two best selling books and has a range of fabrics available at Hobycraft. Although a “quilting expert” Stuart has also featured as one of Sew Magazine’s “Dressmaker of the Year” judges. Scottish born Lauren now lives in Birmingham with her husband where she owns the well-known fabric shop Guthrie Ghani. As well as the bricks and mortar shop Guthrie Ghani are also online selling fabric, haberdashery and patterns. Lauren also runs sewing classes from the shop in Birmingham and often blogs about her makes. The first ever male winner of the Great British Sewing Bee, Matt can now be found at www.sewwhatsnew.co.uk a “creative lifestyle blog and is also the author of “Make it Your Own.” Matt has collaborated with Singer Sewing Machines and if often featured in our favourite sewing and craft magazines. Season 4 winner Charlotte has left her former life as the editor of a scientific journal well and truly behind her! Now an award winning quilter she is a regular on the Sewing Quarter. She also offers online tutorials on her website and often features as a guest columnist in popular sewing magazines. Still the youngest ever GBSB contestant Jade went on to be a finalist. She currently has her own column in Love Sewing Magazine and is working to develop her own line of patterns. Jade is also regularly involved with the Knitting and Stitching Show and The Great British Sewing Bee Live. Irish Angeline is the resident sewer on Ireland’s RTE TV channel. As well as this she has her own sewing blog and You Tube Channel. She is currently going live on Instagram every Tuesday after the GBSB to chat about the latest episode, often with a fellow contestant, perhaps we should invite her into the Sew Confident FB chat group! So for any of us hating the day job and dreaming of a life behind the sewing machine, perhaps The Great British Sewing Bee 2020 is your big chance to change your life! Where do we sign up!? Hey! My name is Dominic, I’m 21 years old and am currently studying at Strathclyde and work part-time in retail. This means, like a lot of people my age, money doesn’t spend a lot of time in my bank account. Whether its rent, travel or groceries - young adults are always having to budget and save money where it’s possible, and in my case I tend to save money on clothing. Up until recently, I was on the lookout for fashion sales in high-street stores or online retail platforms, however my foreign study semester in 2017 changed this mind-set; I found myself studying in a university in Malta, a country with limited retail options and expensive delivery charges. I decided to try vintage stores and charity shops to save money, and fell in love with the idea. Not only did I find clothes at a fair price, but the style and culture behind the recycled fashion experience allowed me to better express myself in an environment that was new to me. It was an activity that encouraged me to explore different areas of the country in an exciting hunt for outfits unique to me, all the while saving money and meeting new people doing the same thing. In a world where sustainability and reusing is more important than ever, it helped me feel like I was doing my part in reducing my carbon footprint as well as giving time and money to those who require it most, rather than multi-million companies where all you are to them is an order number. I kept this mind-set when I came back home at the end of 2017, and made my resolution for the New Year to only buy clothes that have been used and loved before. Luckily for me, there is no better place to do this than in Glasgow! I have a love for retro looks, so I found myself at vintage kilo fairs more than I’m willing to admit. It is never a dull place to be and some of the clothes that I found were one of a kind. From jackets to footwear, there is something for everyone when you look hard enough. I always go and check out a charity shop whenever I walk by one, and Glasgow have so many to offer. The West End and City Centre provide a great variety to choose from, with a Bernardos in Merchant City being my favourite. The Glasgow outskirts are always fun to travel to as well, such as local charities in Giffnock and Inverclyde. You would be surprised how often new items come in to charity shops, and that’s what entices me the most. I manage to find a new outfit once a week usually, and never spend more than £15 in total. There are always big-brand items as well (some I’ve found include Ralph Lauren and AllSaints, as well as retail brands like River Island and Zara) which are always in pristine condition, with designs that make others turn heads. Some other items you find in charity shops would surprise you; things like bags I use for university, kilts and formal attire, sportswear and retro football shirts are just a few which might catch your eye. And that’s what I would say to anyone that might be sceptical about shopping in charity or vintage shops; what is the worst that can happen? I have loved every second of my resolution and plan to continue it in to 2019. I even plan to learn some sewing skills, to help with mending and upcycling items I find to make them even more unique! It excites me to know that you won’t bump into anyone who shares the same clothes as you do, and you ultimately get to wear the unique clothes that define you at a fraction of the cost you might think, all whilst contributing to inspiring and meaningful causes. When someone asks me where I got something that I’m wearing, I take pride in telling them, “Vintage Shop, mate”. With it being New York Fashion Week, have you ever wondered how easy it actually is to make your own, ‘cat walk ready’ clothes. One of my favorite pieces from this years cat walk so far is a simple but effective skirt, from the Mint Moda Collection. Although such a simple piece of clothing, a skirt is able to turn your body shape into something completely different. Hugging in at the waist and flowing down the body, is the skirt style that ‘Mint Moda’ went for at New York Fashion Week 2019. A simple design, yet with the colors they used, they have brightened up the cat walk. Feel like giving it a go yourself, here are some patterns you may want to use. And you can make you very own cat walk ready skirt. Feel like you may need some extra help or feel like you want to take your knowledge further, why not come along to one of our pattern classes. for more information on these classes please feel free to contact us . We’ve recently been joined by another sewconfident team member! Kirsty is going to be with us for the next month! Kirsty’s going to be coming along to one of our beginners classes as well, you can see them here if you want to come along to one too! Here’s a little bit more about Kirsty . . . The course that I study is called Food, Nutrition and Textile Education. I study this at Perth College (University of the Highlands and Islands). Why did you decide to study this degree? I chose this course as at school I was extremely interested in Home Economics and every aspect that it offers young people. It is not only a fun and interesting subject, but it also offers many life skills for young people who may need them the most. Why is Home Economics as a subject important to you? I believe that Home Economics is important in schools as it teaches many life skills that most children may not be taught at home. These skills include knowledge on nutrition and a healthy life style, cooking skills that can be used throughout your life and textile and sewing skills that can always be helpful. All these skills are useful to everyone throughout a lifetime. Being a teacher has always been what I have wanted to do. I enjoy passing on my knowledge and seeing others succeed after using the knowledge I have provided. I enjoy with both young and mature students. While at school, what was your most liked and most disliked classes? Well, of course my favourite class in school was Home Economics. The class I probably disliked the most was maths, it was never one of my strengths. With whatever free time I have, between balancing uni, part time employment and socialising. I enjoy spending quality time with friends and family. This includes going out for food and drinks and having cosy nights in, just relaxing and watching movies. Have you done a lot of sewing/textiles? What is your favourite thing you have made? Unfortunately, having only the limited skills that I was taught In my first year at High School, I don’t know a lot about sewing. However, I am extremely intrigued by it and can’t wait to learn more from my time at Sew Confident and throughout my four-year degree. During my school placement that took course over four weeks, I was able to engage in many first-year textile classes. In these classes the children were able to make a pillow. They were asked to decide colours of fabric and, also the design that they wanted on the front of the pillow. I was also able to make my own pillow alongside the children, I decided to make it for my baby niece, and to be honest, it turned out great. What about the cooking side, what is your go to dish? Cooking is something I have always loved, and throughout the years I have massively improved on my cooking skills and knowledge. My go to dish is always pasta, my favourite being tagliatelle pasta with sweet chilli and garlic prawn, this one also never fails to impress. Here are a few other unusual ideas for valentines cards! Just to add a more personal touch, whether it be for your husband, wife, girlfriend, friend, mother, brother, sister. . . Whoever your valentines is this year! It’s with a bit of sadness that I write this blog today. Some of you might already know the news that our Bothwell studio is now closed. I wanted to let you know why and to do that I need to go back to the start. Our Bothwell studio was always a risk. It’s 20 minutes up the road from our Glasgow one, it’s in a totally different area, and that is exactly why I picked it. You might know that our plans to grow our Sew Confident Community involve franchising. In order to franchise you need to give franchisees “territories” and in order to know how close studios can be I had to try it myself. Did I think it would work? Yes absolutely but I was always aware of the risk - which is something you gotta just run with in business sometimes! The reality is it’s just too close to the Glasgow studio so we had a similar number of people coming to us but twice the overheads. We now know that our studios are a 1 per city kind of deal and that people are happy to jump in the car to come to their nearest studio. If I could turn back the clock I would do it all again because what we as a company learned was invaluable, we met so many amazing people, had so many laughs and hours of sewing in that amazing space so thank you for being part of that. No regrets! So what’s the future of Sew Confident? Despite closing the Bothwell studio our Glasgow studio has NEVER BEEN BUSIER! Our Dundee studio is also offering more and more classes every month, surpassing expectations - they now have a massive list of classes for all our Dundee pals. And have you SEEN the Dundee studio? It’s absolutely gorgeous, there was talk of some of my Glasgow students jumping in the car to go and visit Sandra in Dundee just to hang out in that studio! Big picture wise I want everyone in the UK to have a friendly, social, creative and safe Sew Confident space near them. That’s the goal. We’re creating opportunities for those who want to be their own boss and we’re making creative jobs where their previously were none. I thank my lucky stars every day that this is my job. And I’m blessed to get to spend my working day with the amazing Colette, Rosey and the fab tutors - it’s a total dream team! Most of all I feel lucky that our customers become friends because we’re all on the same crazy fabric hoarding page over here and apparently that’s all you need to really click with someone! Seriously though, without you guys we wouldn’t be here so thanks for your continued support over the past 7(!!) years. Here’s to another 7 years of sewing, tea drinking and excessive biscuit consumption! Sewing with a new born…It’s not really a thing is it? I had grand plans to set my beautiful new baby in its bouncy chair and set to work sewing while the baby slept soundly. Ha ha…Reality came crashing down around me. Finding time to sew was impossible. I think the closest thing I came to being crafty during the first 6 weeks was knitting a single row on a scarf I was making (for myself). Then came a rare day when my husband was off work and there was no housework to be done. Now don’t be hating on me, all this happened because of specific well timed events, mainly an in home lifestyle photo shoot for the arrival of our beautiful baby boy. I found myself with an hour to myself and I ventured into the sewing room and I made a garment. An actual wearable top. Sounds impressive I know but it was a pattern I’ve made twice before and I had already cut out all the pattern pieces pre-baby so all the hard work was done. It’s 4 weeks later and I haven’t sewn anything else BUT I have had time to think. Sewing has now become just as much about the planning as it has the actual sewing. I find I’m taking more time choosing fabrics and thinking of what to use from my stash. I’m planning on investing myself in more quality sewing rather than too much of a sew and hope. Reading patterns before I sew them is becoming a thing, feels like I’m learning more. Also I have booked babysitters to cover any upcoming classes and the sewcial for this month. Grans are awesome!! Hello pregnancy, goodbye sewjo ! I think that’s exactly how it happened, well I’m pretty sure of it anyway. I was on a roll with my sewing, had a started my own sewing blog, curated my instagram, sorted out my sewing room and had sewing plans for the year made which did not include a new pregnant body I can assure you. That’s pretty much what halted it, the pregnant body. All of a sudden I had to try and dress this bump. Everything I wore was stretchy. I had no motivation, no patterns caught my eye, it was either a pattern that suited pregnancy only or a pattern that I would need to wait until post pregnancy to measure myself so no point even embarking on it. I didn’t know what shape I was going to be once I had the baby so felt like I couldn’t even plan for new me made outfits. Meanwhile every insta blogger is churning out the latest patterns, it felt like there was a new indie pattern released every week. Then the hallelujah moment - enter Tilly and the buttons Stevie pattern. I adored this pattern while pregnant, it draped nice on my body and didn’t make me feel like a whale. I made four in total (two dresses and two tops, I've included a photo of one of the dresses) It’s best points being that it was simple and quick to make and felt like it could be worn as an oversized t-shirt dress post pregnancy, I’ve road tested it and it falls into the secret pyjamas category. Just throw an oversized cardigan on with it and wear it with tights and it looks fab. The moral of the story - I don’t have one but does there need to be one? I lost my sewjo for a while but it’s coming back slowly. There are new ideas cropping up in my brain and suddenly fabric is making its way into my wish list again. I think I stressed out about having no creativity and thinking it wouldn’t come back but it did though plus I think I will appreciate my sewing time a little more now that it’s limited. New Year, Same Fabulous You. What we SHOULD all be doing this year, may it not be the start of this year…maybe not even next month over even this year, is to learn all about SELF LOVE. Focus on the things you are already interested in or good at, or even things you are bad at but enjoy & LOOK FORWARD to improving. In this case, being crafty. Now i’m no life coach, I probably have a cheek to be talking about self love as I know I can be very hard on myself…BUT one ‘goal’ I do have for 2019 is to sew more. GROUND BREAKING, I KNOW, This isn’t even learning something new! I’ve had more downs than ups over last year, but the one thing that really helps is being creative and sewing, yet when people ask the last thing i’ve made I can barely remember. I’m so guilty for ‘knowing what’s good for me but ignoring it.’ I think that’s why I love the whole idea of Sew Confident so much. I can already hear everyone reading this saying I’m being biased haha - maybe I slightly am. Although class after class after class, the one thing that is always said is how people love that they have dedicated time to coming along and being crafty. That they are the same as me and often get distracted at home or feel guilty for taking time out of their busy lives to get creative. IT HELPS MAKE THE SAME FABULOUS YOU, EVEN MORE FABULOUS. A New Year, A New Sew Confident Employee. . .
Now that everyone is sadly back to work…We hope you all had an amazing Christmas and New Year! Has anyone got any New Years ReSEWlutions? (See what we done there)! It is always good to set yourself a goal, whether its personal, work or relationship related! Want to be featured in our New Years ReSEWlutions blog? Send in your Christmas makes and ideas for 2019 to hello@sewconfident.co.uk , by the 14th of Jan. There has been some changes already this year in the Glasgow studio…starting with a new staff member! Everyone say a big hello to Rosey, who has joined the team and is taking over from Colette as our new official studio manager -EXCITING! Before Rosey introduces herself, if you were lucky enough to get any Sew Confident Gift Vouchers over Christmas make sure to book up soon as classes are filling up fast! An outfit from my graduate collection! Hi everyone, I’m Rosey! I learnt to sew in high school and have been mad for it ever since! I recently graduated from Edinburgh College of Art from a fashion design course. Whilst there I learnt how to machine knit, which proved to be crazy addictive! I knitted the majority of my final collection there as well! Creating my own patterns and making the clothes for that had to be the hardest things I’ve ever made! I’ve always loved being surrounded by creative people so will be excited to meet all of you sewers, knitters and crafters and see your amazing projects! I’m still on my knitting craze so that's what I’ll be making at the moment, and whizzing everything together on the overlocker! I also like to make recycled outdoors wear, this is me in a recycled parachute windbreaker. Everywhere we look there is Frida Kahlo designs to be seen! What are your thoughts on this latest trend or are you still a little unsure on who this famous mono brow lady even is…? Considered one of the Mexico's greatest artist, Frida Kahlo was born on July 6, 1907 in Coyocoan, Mexico City, Mexico. Frida painted many portraits, self-portraits and works inspired by the nature and artefacts of Mexico. Inspired by the country's popular culture, she employed a naïve folk art style to explore questions of identity, post-colonialism, gender, class and race in Mexican society. Her paintings often had strong autobiographical elements and mixed realism with fantasy. In addition to belonging to the post-revolutionary Mexicayotl movement, which sought to define a Mexican identity, Kahlo has been described as a surrealist or magical realist. Never wanting to miss a trend, here at Sew Confident we have created our very own, super cool item. DRUM ROLL PLEASE… Ladies & Gentleman, now available via the website or from our studios - A Frida hand embroidery kit! Wanting to see what else we are loving? Check out below some of Colettes best finds! Just click the image to follow on to the website I found them on. Have yourself a homemade Christmas. With Christmas FAST approaching it is time to start panicking about if it is acceptable to buy your Dad socks for the 4th year in a row. To put it bluntly, NO! Gone are the days of buying pointless (often expensive) gifts that your loved ones might not even need. With the word BREXIT bringing fear into peoples eyes and the thought of climate change ending the world by 2020, Colette & Jenny are here to tell you the best ways to save some pennies while still supplying the best Christmas gifts in the family and maybe saving a wee bit of the planet too! You often save some money because lets face it, we all have TONS of fabric lying around that we could use up. No need to stress that the personal already has this item as it is one of a kind! People LOVE thoughtful, handmade gifts & even something like a simple tote bag is impressive to those who can’t sew. It can be good for the planet; This Christmas I want to create more eco-friendly, re-usable gifts! When it comes to gift giving you should always play to your strengths (e.g. Sewing, knitting, painting etc) and if you haven’t yet found your creative strength there is still plenty of time. At our overlocker class you not only learn how to use these amazing machines, you also leave with a wear-able top - all in one night!! (I plan on making one of these for my cousin in a Harry Potter print since she is a BIG fan). Travel bag set for Dad, similar to the one I done for the blog ‘sew-along’! I am even hoping to make my own gift tags. This will allow me to use up any scraps made from my projects and a good excuse to do some fun machine embroidery. The tags can then be kept and used as Christmas tree decorations for the following year! The ONE gift I will be buying is a small beginners sewing machine for my 5 year old cousin Summer who can’t wait to ‘be a fashion designer like her big cousin Coly’. I am already looking forward to what homemade gifts I will be receiving from her in a few years time…! Well how do I follow on from Colette? I’ll give it a bash! I’m definitely feeling more inclined to put more thought into this years Christmas gifts and not just because my favourite Martin Lewis told us to! Maybe it’s because I’m getting older(ripe old age of 31) but I’m starting to value peoples time more and more, whether they choose to spend it with me or if they use it to make me something lovely - so that’s what I plan to do this year! In my household I am the crafty one - no suprises there but my partner is an amazing cook so as far as gifts go we’re actually a good team! He’s going to make loads of lovely foody things like chutneys, jams, fancy olive oils and flavoured alcohols. On the cooking front I might make some biscuits because I am pretty obsessed with the videos that keep popping up on my instagram of people decorating them…watch this space to see whether the decorating ACTUALLY goes to plan, or if any of them actually make it out of the kitchen without me or Steve eating them ourselves! Sewing wise I’m going to be utilising my favourite machine - the embroidery machine - to customise some bits and bobs! Just like our Personalised Christmas Pressie class! I’m also planning some hand embroidery embellished items because I have been LOVING doing hand embroidery all cosy on the sofa in the evening! There’s definitely still time for you to get involved with our Hand Embroidery classes in November and December! Whatever you end up doing, make sure you crank up the Christmas tunes and have a lovely festive time while you do it. And if like me you make biscuits and end up eating them all before they make it into the gift bag then make sure you take an Instagram of it before the get demolished so at least people know you tried!